This drawing room furniture set features lots of posh accessories for yor Sylvanian home - a grandfather clock for example! 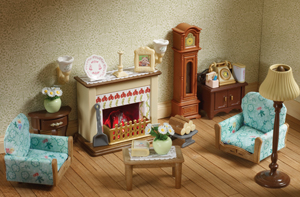 Set includes everything you need to furnish your Sylvanian living room - 2 matching armchairs, coffee table, side table & flowers, grandfather clock, standard lamp telephone and cabinet, and a real glowing fireplace. Also includes a host of accessories.